Train service is back to normal after workers stopped trains before they reached their destinations. 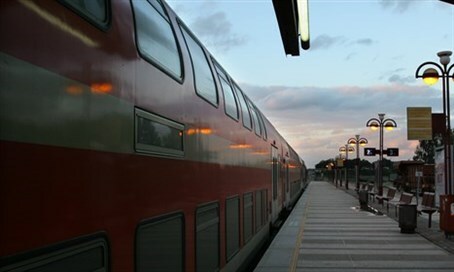 Train service is back to normal after Israel Railways employees and management reached an agreement about relocation of the Railways' garage from Lod to Be'er Sheva. The agreement was reached overnight after Railways workers staged a surprise strike Sunday afternoon and disrupted service on the line connecting Hod Hasharon and Be'er Sheva. Five stations were shut down with no prior warning: Tel Aviv Haganah, Moshe Dayan in Rishon Letzion, Yavneh West, Holon and Sderot. Passengers were made to get off the trains that they were on without reaching their destinations, causing anger among many who were thus stranded on their way home from work. "The strike only lasted for a few hours and in the end an agreement was signed," and there was only some "slight discomfort" to passengers, maintained Avi Edri, Head of Transport Workers' Union in the national Histadrut labor federation, in an interview with Army Radio. "The language of force is what management understood," he said. "This is a tool that the law gives us, and we have no choice sometimes but to use it, and sometimes it hurts." The union said that it had given employees instructions not to make passengers get off before their stations, but that Management's decisions created overload at the stations and this necessitated taking passengers off the trains.